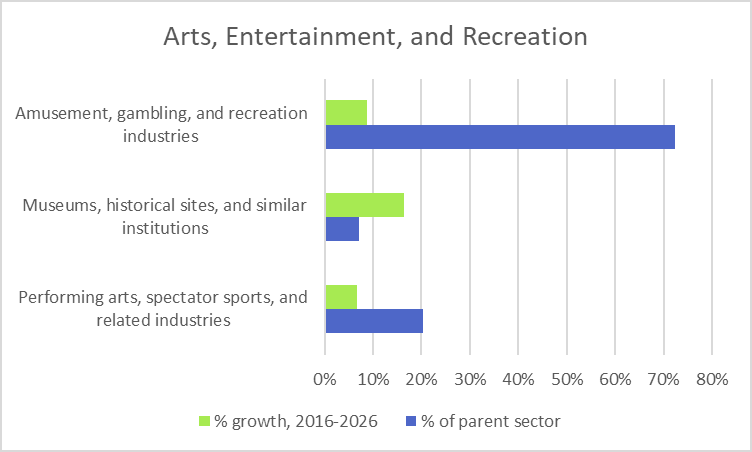 The Performing Arts, Spectator Sports, and Related Industries subsector is part of the Arts, Entertainment, and Recreation sector. The following table shows the top 10 projected occupations, in size, for this subsector through 2026. It also shows the educational requirements and OJT requirements for these top-sized occupations. The following table shows the top 10 projected occupations, in growth, for this subsector through 2026. It also shows the educational requirements and OJT requirements for these top-growth occupations.